Do You Waste Time Feeling Criticized! How much of our time, talent, and gifts have we each wasted feeling criticized about our body shape, or size, or configuration…or even just worrying that others might possibly criticize us? How much time would you say you waste each week feeling criticized? Have you spent time desperately wishing we could look different; thinner, taller, longer legs, bigger or smaller breasts, straighter nose, older, younger, less hairy…you name a body part and we can be unhappy about it. That’s why I loved this video and its message! Listen as Rachel Farnsworth, the Stay at Home Chef and food blogger, responds to critical comments posted on her YouTube Channel. Done feeling criticized for the body you have? Then, BE THAT PERSON! What do you think? What, if anything, keeps you from embracing the body you have? I’m hearing really good things about this new documentary, EMBRACE. Have you seen it? God knows we need more opportunities to spark discussion about body image; embracing body diversity ! In her own words, here’s what creator Taryn Brumfitt says about her film. To find out where to see the documentary, or how to host a screening, click here. Sound familiar? That’s what one of our newest Members just wrote about in our Support Circle. I so understand. I used to eat for the same reasons! I used to think I lacked “willpower”. But how could I be so hyper vigilant in other areas of my life and still fail at every single attempt to fix my emotional eating? I ended up thinking I must be self sabotaging. Why else would I keep doing this; eat as a reward, eat to disconnect, eat to self-soothe…and hate myself for continuing to do so? Something just didn’t feel right. Something was missing from my understanding of this! No one yet knew what neuroscience was about to tell us. The brain held the secrets to why I felt out-of-control with food. My life experiences, to date, had programmed my brain to FEEL I had no choice BUT to turn to food when the emotional intensity went up. Some situation, or exchange, or time of day would trigger me, often out of my conscious awareness, and I’d get this automatic FIGHT – FLIGHT – FREEZE feeling. The EMOTIONAL – ACTION SYSTEM that resides in my BOTTOM – PRIMITIVE BRAIN suddenly was telling me I had absolutely NO CHOICE BUT TO EAT and I believed it. Today, I know how to stop those old programs from running my life. I know… and more importantly no longer FEEL I have to turn to food to survive the uncomfortable moments of my life. I don’t have to eat as a reward. I have learned how to stop those false feelings. I have learned how to step back and get my TOP BRAIN – EXECUTIVE FUNCTION – PREFRONTAL CORTEX to run the show. I am no longer driven by bottom brain, by that fight- flight- freeze feeling. Now that we know how to change brain programming; how to make new neural pathways in the brain (that’s called neuroplasticity), we understand how to use our brains to reduce the habit of emotional eating…it’s very exciting! I am Ellen Shuman, a pioneer in the field of binge eating disorder treatment; a brain-based coach who specializes in helping people overcome binge eating, binge eating disorder, emotional eating, compulsive eating, and food addiction. I am the founder of A Weigh Out Life Coaching & Members’ Circle, Acoria Binge Eating Disorder Treatment (1993-present). I was also a founding board member and a Past President of the Binge Eating Disorder Association (2011/2012), Contact me, ellen@aweighout.com, 513-321-4242. Love Food But Had It with Being an Emotional Eater? Who doesn’t love food? But have you ever had food talk or write back to you? 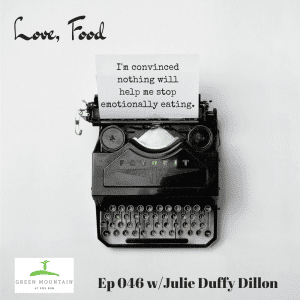 That’s the premise behind Julie Duffy Dillon’s Podcast, “Love, Food” ! A mutual colleague recently introduced me to Julie. It’s so exciting when you find someone else who truly “gets it”! That’s why I said yes, immediately, when Julie asked me to respond to one of her listener’s letters. This listener, like so many of us, has had a long history of struggling with binge eating and emotional eating. Sure, most people enjoy eating and love food but, as any compulsive overeater knows, this problem goes way beyond what we do when we merely love food. If you’d like to listen to the full recording of Julie’s and my advice to this person, CLICK HERE. Once on the page, scroll down past the Key Points and Show Notes and you’ll see the audio player. I’m also pleased to announce that Julie will be my guest in the A Weigh Out Members’ Circle. A brand new TeleSeminar with Julie and I will be posted on December 15th, 2016, on my TeleSeminar Page . Wearing her hat as a “Food Peace Promoter”, Julie will help us define, “What is Normal Eating?”, and we’ll touch on many topics relatable to anyone who struggles with emotional overeating, including some great new information about managing PCOS and Binge Eating. I am Ellen Shuman, a pioneer in the field of binge eating disorder treatment; a Coach who specializes in helping people overcome binge eating, binge eating disorder, emotional eating, compulsive eating, and food addiction. I am the founder of A Weigh Out Life Coaching & Members’ Circle, Acoria Binge Eating Disorder Treatment (1993-present). I was also a founding board member and a Past President of the Binge Eating Disorder Association (2011/2012), and Co-Founder of the Academy for Eating Disorders Special Interest Group on “Health at Every Size”, ellen@aweighout.com, 513-321-4242. I love Halloween and I love dogs! Put the two together and I’m giddy. So forgive the deviation from topic but this just made me smile from ear to ear. Oh, what our dogs tolerate! She and I both had an immediate reaction to the stick thin, TOO THIN body of “Katie”, owner of “Max”, the dog. Those red sticks you see in this picture are her legs. For the full effect, to see why we gasped, play the video below. Then freeze it 12 seconds in. 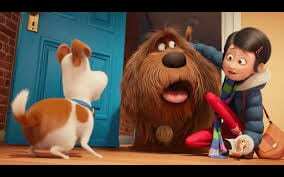 Katie appears to be a totally cool young working woman with her own apartment in Manhattan and a great dog; a real role model for millions of impressionable young girls and young boys who will see this movie (not to mention the middle-aged pet enthusiasts like my friend and me). During the story-boarding, animation, and market-testing phases of this movie project didn’t anyone stop and say, “Is there a reason why we’re making this character so thin some people might think she has anorexia? Is this a good idea for a kids movie?” It’s not like there was a subplot coming where the dogs help Katie overcome an eating disorder. In the past couple of years France, Israel, Spain, and Italy have passed laws cracking down on the use of too thin, unhealthy looking models. Some of the laws require that very skinny models have a doctor’s notes before they are allowed to work. Can’t common sense rule? Or do we have to pass legislation banning too thin cartoon characters in movies for kids? The weekend the movie was released, I read several reviews. Not a single one I read made a reference to Katie’s extreme thinness. I’m Ellen Shuman and I believe we all feel impact from what we see on TV and in the movies, whether we acknowledge it or not. I’m a Coach who specialize in helping people achieve recovery from binge eating, binge eating disorder, and emotional eating. I am the founder of A Weigh Out Life Coaching & Acoria Binge Eating Disorder Treatment (1993-present), Past President of the Binge Eating Disorder Association (2011/2012), and Co-Founder of the Academy for Eating Disorders Special Interest Group on “Health at Every Size”. Interested in working with me on your recovery? Please get in touch, ellen@aweighout.com, 513-321-4242. 12 CommentsFiled Under: Changing our World! I saw a report on the 6 o’clock news last week about a new weight loss surgery procedure, touted as” less invasive”(really???). This surgical procedure would involve a tube placed directly into the stomach. That tube will come out from the stomach through a port to the outside of the body. Then, right after eating, the person simply empties the contents of their stomach and throws away the predigested food they just ate….so no weight gain. Doesn’t that sound like Bulimia; just with a new purging method…this one medically sanctioned??? As I understand more and more about why people overeat; emotionally eat, binge eat, feel addicted to food, I am more and more disheartened by the main stream medical community’s lack of understanding, prejudice, and suggested interventions. Doctors don’t know what to do with people who don’t or can’t comply with repeated recommendations to lose weight. It’s no secret that weight stigma is alive and well in the medical profession (I have co-authored reviews of that literature)…and I know coming up with THE new weight loss surgery is a BIG money-maker for surgeons and hospitals…but what happened to “First, Do No Harm”? I fully understand the desperation that would make any weight loss surgery seem like a good option to someone who feels out-of-control-with-food and/or with life. I have to admit, even after all these years of being a recovering binge eater, on the surface the idea that I could eat everything in sight, when desired, and not pay for it with weight gain, has its appeal. But then I remind myself that my binge eating was not about food. It was about going numb…and no amount of weight loss was going to fix that. I know that to be my truth because I lost a lot of weight, many times, and I still felt like I couldn’t tolerate being in my own skin. Of course emotional eating and the weight came back, with a vengeance! Back then, turning to food was the only tool I had to self-soothe. Eating was about comfort and escape, not about food! Understanding that was critical to my recovery! As I have studied and come to understand the latest neuroscience breakthroughs, and have incorporating those into my work with my clients and into my own recovery from binge eating, I am truly convinced that rearranging one’s organs through weight loss surgery is not the way to fix compulsive overeating, long term. I doubt there will ever be a way to surgically rearrange body parts that will stop that fight, flight, need-to-escape-the-moment-and-go-numb-feeling that takes over right before a binge. I’ve been told by many people that they’ve felt pressured by their physicians to consider weight loss surgery; to the degree where the patients stopped seeing those doctors. The patient knew surgery was not going to fix what was driving their emotional eating issues, said they shared that with the doctor but the patients felt their doctors didn’t seem to understand what they were trying to explain or didn’t seem to care. They just kept pushing surgery as the best option. Medical industry insiders have told me that surgical weight loss interventions were originally designed for those who were at great and eminent risk of dying without it vs the way it is sold today. So, it’s critical that we ask ourselves when and why did weight loss surgery, which has little to no data suggesting people keep off the weight long term, become the go-to strategy for improved health (if you can find that data, please let me know)? I am Ellen Shuman, a pioneer in the field of binge eating disorder treatment; a Coach who specializes in helping people overcome binge eating, binge eating disorder, emotional eating, compulsive eating, and food addiction. I am the founder of A Weigh Out Life Coaching & Members’ Circle, Acoria Binge Eating Disorder Treatment (1993-present). I was also a founding board member and a Past President of the Binge Eating Disorder Association (2011/2012), and Co-Founder of the Academy for Eating Disorders Special Interest Group on “Health at Every Size”. Want to know more? Get in touch, ellen@aweighout.com, 513-321-4242. Pursuit of perfection…unless one is attempting to cut an expensive gemstone–I’ve come to see the pursuit of perfection as a waste of energy…and worse than that; often an endeavor that leads to a great deal of emotional pain. There is no such thing as a perfect person; not in the people we love or in ourselves! Yet, so many of the people I coach are crippled by the pursuit of perfection; this imaginary black or white marker; a determiner of self-worth…applied to self and others. Holding someone else up to some perfect ideal…or trying, personally, to live up to some self-imposed (or family imposed) impossible standard, feeling driven by perfectionistic thinking, often goes hand-in hand with emotional overeating. “The pursuit of perfection tends to generate a great deal of anxiety in a person’s everyday life! Emotional eating is intricately linked to perfectionistic thinking. Food thoughts and food quiet the anxiety. Food is also used to manage any unresolved anger and/or disappointment the person may feel about having been a child who was never affirmed for her efforts and was never “good enough”. Additionally, when the person hunts for the ‘perfect’ solution to the eating disturbance, and fails to find it, she uses food to manage her disappointment and pain over this issue, as well. Often, the person who believes he or she has to do things “perfectly” is aware of this way of thinking and knows the impact it has had on his or her life, but struggles to change it. Sometimes a person thinks he or she must do everything perfectly, or the world will truly know just how imperfect and flawed they really are. Trying to be “perfect” is the ultimate cover-up…and an impossible goal. It’s a tough way to live! I know. I am a recovering perfectionist! I’m Ellen Shuman; a proud recovering perfectionist! I work with other recovering perfectionists who also wish to overcome emotional eating, compulsive eating, binge eating disorder, and food addiction. I am the imperfect founder of A Weigh Out & Acoria Binge Eating Disorder Treatment (1993-present), Past President of the Binge Eating Disorder Association (2011/2012), and Co-Founder of the Academy for Eating Disorders Special Interest Group on “Health at Every Size”. Want to pursue imperfection? Get in touch, ellen@aweighout.com, 513-321-4242. 2 CommentsFiled Under: Changing our World!